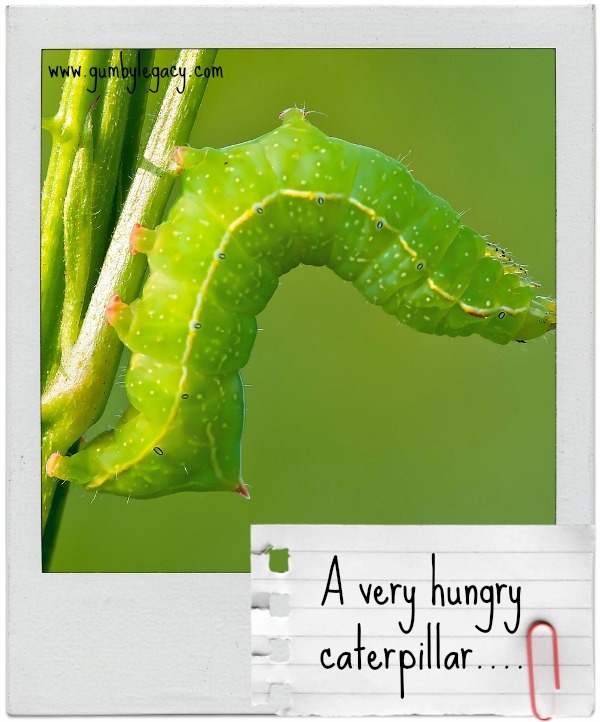 Caterpillars have always been fascinating to children, & Eric Carle’s book, The Very Hungry Caterpillar has to be one of the great classics of our time, known by all children & adults. We still have the copy somewhere that my children grew up with, getting on for forty years ago. Now a days, there is a plethora of toys, teaching aids, activities & even crockery with matching cutlery sets to help reinforce love & interest in this particular caterpillar. A hairy little monster caterpillar! Caterpillars are actually the larvae of butterflies & moths. They all have six true legs & up to 10 fleshy false legs at the back that help them move along leaves & twigs. There are hairy ones & smooth ones that look almost like pea pods. Some look like little monsters, while others resemble what they will become when they emerge from their cocoon. Whilst caterpillars are voracious feeders, most are herbivorous, some insectivorous and some really will feed on wool or even horns & hooves of dead animals. 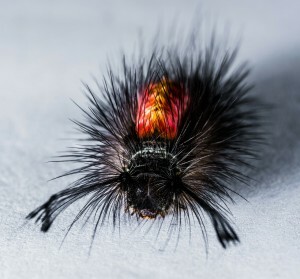 www.muchingcaterpillars.org is a really useful resource, with everything including which particular plants that different caterpillars enjoy to eat & pictures of individual caterpillars accompanied with one of what they become. Often you will find a caterpillar by looking on the underside of a large hole made in leaves of a favourite plant!, In turn, caterpillars are often eaten by birds, slugs, snails & other invertebrates. Suddenly, even I feel that what does it really matter if a plant looks a bit ‘moth’ eaten? It is probably just doing it’s best to provide fodder for something beautiful like a Red Admiral, Peacock Butterfly of Hawk Moth for us to enjoy in the days to come! That doesn’t mean to say that caterpillars aren’t considered to be a considerable agricultural pest, that really do need to be controlled in certain environments. Once more a balance is needed to look at the value to be achieved in survival vs control. South Africa has the Mopane Caterpillar, which simply chews through whatever foliage happens to be close by! I remember waking one morning to find a wild sage tree alive with these big fat caterpillars! 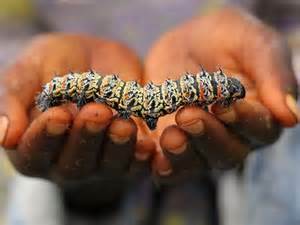 They are called Mopane Worms, even though they really are caterpillars that would love to be allowed to grow up to be moths! I called Bayanda, my right hand man & graphic designer at the time, to ask him what they were. He informed me that these are a delicacy, & whilst he would not eat them himself, many people do. So we collected a litre jar full of the things & took them to work where our staff were delighted with this unexpected delicacy treat! They squeezed out the innards & fried the remains, which is then eaten… Hmm. Been there, done that, won’t do it again! This website is by far the best starting place to begin your appreciation of caterpillars, with lots of activities for children & adults alike. Another good resource is www.nhm.ac.uk which also has a lovely interactive section for children to explore. Have you ever tried eating a Mopane worm or some other exotic delicacy? We’d love to hear what you thought of it!